Alongside our first-class curriculum, we provide a vast array of enrichment opportunities so all of our girls have the chance to learn something new and hone their unique talents and skills. With particular emphasis on music and sport, we have clubs and activities to suit every girl. Girls can follow their passions through to Senior School and Sixth Form, or choose something completely new! 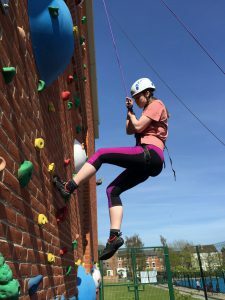 We offer a broad range of outdoor activities to develop wider skills such as leadership, teamwork, confidence and communication. Click on the image to see our climbing wall. Our community links help us to connect to the wider world, preparing your daughter for the world beyond school and inspire her to have a positive impact on the community. We also collaborate with influential businesses to provide our girls with scholarship and work experience opportunities, so they can turn an interest into a lifelong career.